“When [the mountain wheelchair is] overcoming obstacles such as large steps, the front wheels are pushed into the step and with the traction created with all six wheels, the front wheels ‘drive’ up the step. The problem is that the front wheels don’t always get traction [and sometimes just wheel-spin, or even worse, get stuck]”. To prevent this from happening, I had been thinking about using hydraulics or linear actuators to lift the front wheels off the ground before approaching the obstacle. A far simpler method is just to use the motors and brakes which are already on the wheelchair therefore requiring very few additional parts and reducing the overall weight of the wheelchair. This seems incredibly easy to achieve from an engineering point of view, the problem is making it easy for the driver of the wheelchair to operate. If you only had rear brakes, then the wheelchair would skid under braking, so you need brakes on all wheels. As I’m planning to use hydraulic disc brakes off a mountain bike, this does present some problems. These brakes usually have one brake lever for each brake caliper. For a six-wheel-drive wheelchair requiring six brakes, having six brake levers, I think, would be difficult to operate. I have however found this hydraulic hose splitter made by Hope Tech. If I were to use these, then I could theoretically operate three brakes from one lever (one lever for the left, and one for the right). This way you could skid-steer the wheelchair down a mountain just by operating the left or right brakes. If you have one lever to operate the three brakes on one side of the wheelchair, and another lever for the three brakes on the opposite side, how then do you apply the brakes to the rear wheels only? With a solenoid valve on the hydraulic lines which feed the front brakes perhaps? As an aside, the picture above shows a disc brake on one of the motors. This is a very cheap disc brake that I found in the back of my shed, it’s about 20 years old and the pads are worn down. It does at least allow me to do some testing; if I squeeze the brake lever as hard as I can, the motor still has sufficient torque to keep turning. I’ve run the motor like this for five minutes trying to get it to overheat in order to test the thermal protection mechanism which I installed. After five minutes the disc brake was almost glowing hot and smoking, but the motor showed no signs of warming up. A positive outcome. 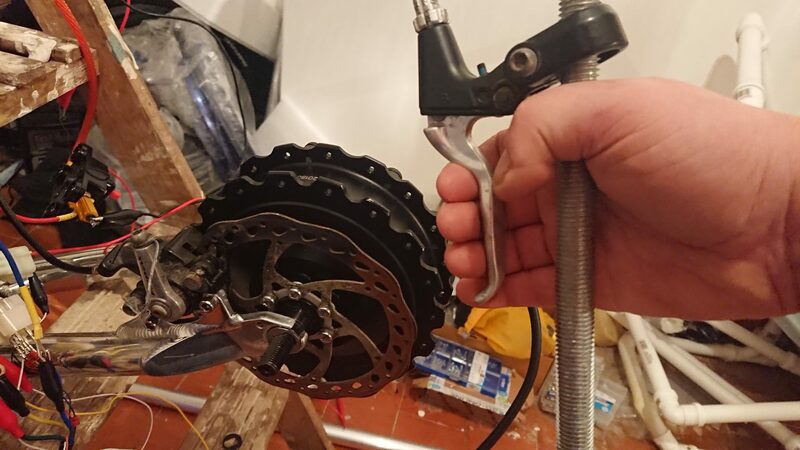 Hydraulic brakes on a mountain bike have a reservoir built into the lever to hold the hydraulic fluid. When you squeeze the brake lever, the pressure moves the fluid from the reservoir to the brake calipers, thus forcing them to close. This is great, except that the levers are designed to operate one caliper only, not three. 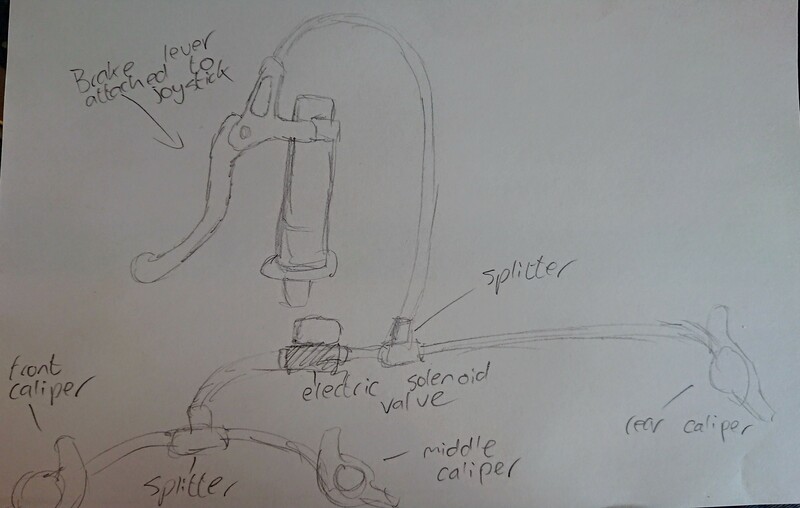 Actually, and this is where the gaps in my experience of engineering start to appear again, I’m not sure that it’s the reservoir that causes the problem, but rather the levers don’t create enough pressure to operate multiple calipers? 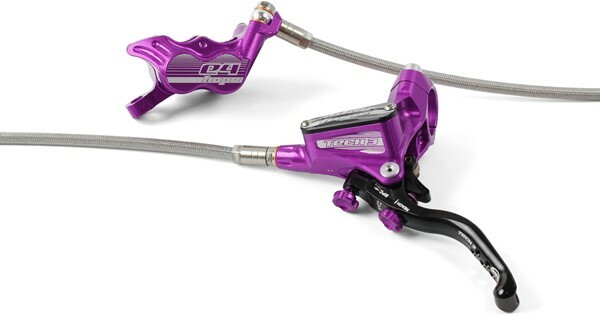 I spoke to Hope Tech and they’ve reassured me that their “Tech 3 Lever” will operate two of their “X2 calipers”, but not three. This is great for two reasons..
Perhaps more importantly though, I think it might be better not to have brakes on the front wheels and I’ve made this video to help illustrate why. The video represents the wheelchair rolling down a hill and then applying the front brakes. As you watch the video, imagine what would happen next. Just like on a mountain bike, it would want to “throw you over the handle bars”. On the mountain wheelchair this effect is amplified because of the rocker-bogie suspension mechanism. In the video, it’s easy to imagine how the centre of gravity moves to the front of the wheelchair and would result in quite a nasty accident with the full weight of the wheelchair, its heavy motors, batteries and frame coming down on top of you. Ultimately, I think this is going to be a trial and error thing during which time there are some other ideas which are worth exploring. It would still be possible to have brakes on all six wheels, it would just have to be setup so that there wasn’t much braking force at the front wheels. As well as this, the motors in the wheels have some resistance anyway; they act as generators which recharge the batteries. I plan to have a “knob” near the joysticks which lets the rider adjust how much regeneration the motors are doing. In effect, this dial would adjust the rolling resistance of the wheels. In this regard, perhaps brakes aren’t needed on the front wheels? Perhaps the best solution though would be to replicate what happens on a bicycle. i.e. have one lever for the front brakes and one for the rear. This would give the rider complete control of the braking balance between front and rear wheels. 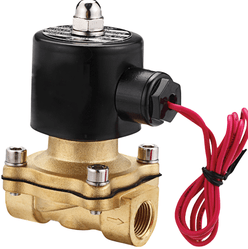 In fact, this would then remove the need for the solenoid valve. To lift the front wheels off the ground, you would just have to squeeze the left brake lever (which would operate the rear brakes) and drive forwards. Far simpler than having to operate switches as well as brake and drive at the same time and for people who previously were passionate cyclists, this setup might be more familiar to them. The only problem with this is that it removes the ability to steer the wheelchair by operating the brakes. As I say, I think this is largely going to be trial and error.